I am rather particular when it comes to stovies. Sometimes when we’re out for a walk on a chilly day, we’ll stop in at a pub for some lunch. If there are stovies on the menu (a hearty Scots dish of potatoes slowly cooked with dripping and onion), I’m always tempted to order them. They are perfect cold weather fodder. Problem is some folk have funny ideas about what makes stovies and, more often than not, I’m disappointed by what I’m served. Now, these “folk” with their “funny ideas” do, admittedly, tend to simply be from areas of Scotland other than Aberdeen. Usually, I’m all for regional variations, variety being the spice of life and whatnot. But, really, who puts sausages in stovies?? Stovies should be moist but not runny. The potatoes should be sliced thickly and disintegrating, not chunky or mashed. And the meat, the meat should be shredded beef or lamb; it should not be chicken or corned beef or – splutter – sausages. 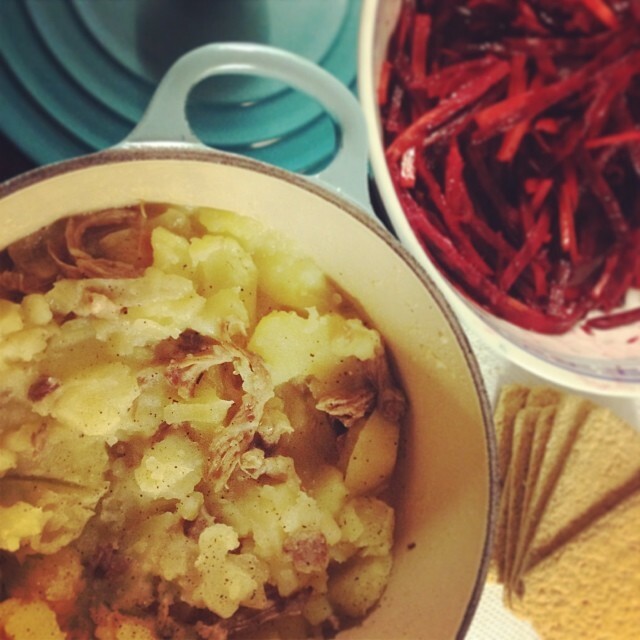 Finally, stovies should be served with oatcakes and beetroot. In a heavy based pan, fry the onions in the fat until soft and just starting to turn golden. Remove pan from heat and pour onion and fat into a bowl. Build layers of potatoes, onion/fat and meat, adding a little sprinkle of salt and pepper each time. Once all the potato etc has been layered add the stock and meat jelly and place back on the heat. Heat until the liquid starts to boil then reduce heat to low, place lid on the pan and cook gently for an hour. Check occasionally to make sure they haven’t dried out and add a splash more stock if they look like they might. Serve with oatcakes and fresh or pickled beetroot. This entry was posted in Food, Recipes, Scotland and tagged food, recipes, Scotland, Scottish food, Stovies. Bookmark the permalink. I am very ignorant of a lot of scottish dishes as they are too meaty for me but I would love to try them without meat – have you ever encountered any vegetarian versions of stovies or is that just not right in your book? Sounds like just the thing on a cold winter’s day! OMG I haven’t had stovies since I was a little girl, they used to be my favourite meal! Trouble is I’ve never had the nerve to make them in case they don’t taste exactly like my Nanny made them – I don’t think I could handle the disappointment, lol! Stupidly, I never asked her for the recipe which, naturally, wasn’t written down and my mum never made them. I have seen so many variations down the line, like all good home cooking I suppose everyone has their own way of doing things.Using corned beef, however, would be what our family calls hot pot and sausages are just wrong!! Is the meat jelly the stuff leftover in the roasting pan? It can be vexing when folk dinna ken what is what!! Yum. This sounds like the perfect way to extend leftovers. In step two, do you layer the ingredients in the same pan you fried the onions in? It looks like that, but I just wanted to make sure. I can taste this dish in my head. Mmmm. Yes, Christina – same pan. It’s nowhere near it, but I make a version of Irish stew which has some similarity. It has layered chops cut into bite sized pieces, potatoes, onions and thyme with some stock or water and it is cooked in a similar way. I remember when I moved here in 2003 the idea of stovies gave me the boak… but now I am drooling! Your recipe sounds goooood! These bring back a lot of memories. Maybe time to refresh those memories. Just read this at work and now I REALLY want some stovies for lunch. Not sure anywhere around here sells them though! Brings back childhood memories for me – was oatmeal occasionally added or am I just mixing up stovies and skirlie? These look amazing! I’ve just moved temporarily to Glasgow – looking forward to trying the local food and especially these. Have to say I’m always more excited by the potatoes on the plate than anything else, ever…! My Glaswegian fathers Stovies were made from sliced onions, potatoes and ‘square’ sausages, well seasoned, and steamed in a pan with a little water or stock. My Lanarkshire mums recipe used leftover roast beef and gravy and were more similar to the style found in Aberdeenshire where I know live. I love both styles. The differences were dictated by affluence and what was available. I just made a ridiculously easy impromptu version that was very like my own gran’s, and which my 6 year old very unusually demanded a third helping of (and was refused a 4th). Chopped up some cheap lamb (not much – just a few ounces) and threw it together with some leftover goose fat (superb flavour) in the bottom of a big solid pot with a good lid, followed by one big leak (yes, really – sacrilege to some, but onion family and really works), and a couple of pounds of roughly chopped King Edwards. Leave on a low heat, stirring very occasionally only AFTER they start to stick. A pinch of salt and it’s done. Total prep time, about five minutes. PS – agree very much with the author… sausages! Really?! Corned beef or mince are almost as bad. Has to be either lamb or beef meat, and the cheapest cuts are fine. Rule 1, there are no rules, do what you fancy. I have made stovies from all the yucky ingredients you mention except chicken and enjoyed them all. I might try chuc one of these days. Please – stovies really need heat in an enclosed container – eg a cast iron casserole in a hot oven. When the potato is cooked then you can take the lid off for 15 mins or so to brown the top. Otherwise very close. Soften an onion in some of fat from roast [or oil]. Add potato amount to cater for numbers eg 1 onion then about 1-1.5 KG tatties peeled and sliced. Turn in fat and onion then add any meat shredded, and juices [or stock cube made up to about half a pint.] Stir then cover and put pan or casserole in the oven for about 45 mins. Brown if desired. Never mind beetroot – cabbage, peas or even carrots. I found this site after coming across the lovepotato site where I looked for stovies. Not on it!! Just came across this blog while searching for a recipe for Stovies for my Australian wife (who loves everything Scottish – including me!!) and was amused to see you use sliced potato. I was born and grew up in Aberdeen and Stovies was on the menu regularly, including cafes and restaurants and also in school dinners and always with mashed potatoes. Also I have never heard of beetroot being used as a side dish, oatcakes yes … and the courser the better, but not beetroot. These may have been used in other areas of Aberdeen but not the areas in which I frequented. Stovies are just that – Stovies. Add or subtract anything and it isn’t Stovies anymore. And as for vegetarians, if you want to sample true Stovies, you have to take as is… or cook something else. Sorry but that’s the way it is. As the Two Fat Ladies said on their TV programmes, if you want to substitute an ingredient, then don’t cook it, cook something else. Could you place this in a low oven for an afternoon to cook, or does it have to be done on the stovetop. Just seems like a great prep and leave all afternoon kind of meal. Not sure but I imagine a very slow cook would work perfectly. I grew up eating my Glaswegian Mum’s stovies. She used some streaky bacon as the meat, frying and then softening the onions in the released fat. She then broke away from her roots by cooking them with just a little water and lots of pepper in the pressure cooker.